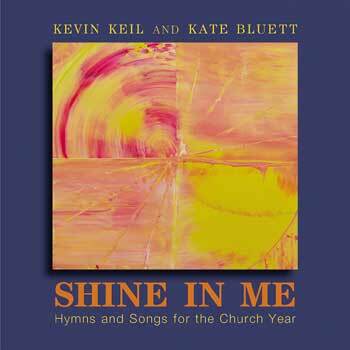 Lift voices in praise with this wonderful collection of hymns and songs from Kevil Keil and Kate Bluett. Shine in Me is a collection of hymns featuring newly composed music and texts for the major seasons and feasts of the liturgical year. Kevin, struck by the richness of Kate's hymn texts, was inspired to compose original music to accompany them. Their collaboration has produced seven songs for choir and assembly that cover the major feasts of the church year. Offering a mixed style of traditional hymnody and contemporary song-writing, this collection is suitable for group worship, personal prayer and contemplative listening with choral arrangements varying from SAB to SATB. From simple keyboard and choir to unique combinations of multiple instruments, including violin, cello, flute, oboe, English horn and brass, all will find something to love in this collection! "Who Is the Crucified," is a prayerful reflection of Christ's sacrifice with a melody that adds depth and poignancy. "Holy Spirit, Come" is a fresh hymn for Pentecost with a strong melody that is augmented by organ, choir and brass instruments while the title track features call-and-response verses for the entire Advent/Christmas season. Taken together, the seven songs in this collection speak to a wide range of musical tastes that add vigor to the song of our Church throughout the year. Offering a unique blend of traditional hymnody and contemporary songwriting, this collection will serve to enhance group worship, personal prayer and contemplative listening. Struck by the richness of Kate’s hymn texts, Kevin was inspired to compose original music to accompany them, resulting in a collaboration that has provided these seven songs for the major seasons and feasts of the liturgical year. Highlights include "Who Is the Crucified," a prayerful reflection of Christ's sacrifice with a deeply poignant melody, and "Holy Spirit, Come," a fresh hymn for Pentecost with a strong melody that is augmented by organ, choir and brass instruments. With a variety of instrumental arrangements, including violin, cello, flute, oboe, English horn and brass ensemble (all available in the octavo packet), these unique sounds and distinct melodies provide every listener with something to love! All together, these songs speak to a wide range of musical tastes and add vigor to the musical worship within the Church throughout the year!